Today is an exciting day as I am sharing with you Aziza Jewelry. Handcrafted, and custom made, she creates the most beautiful and intricite pieces of jewelry. When I contacted her to be a Friday's feature I knew you would love her. 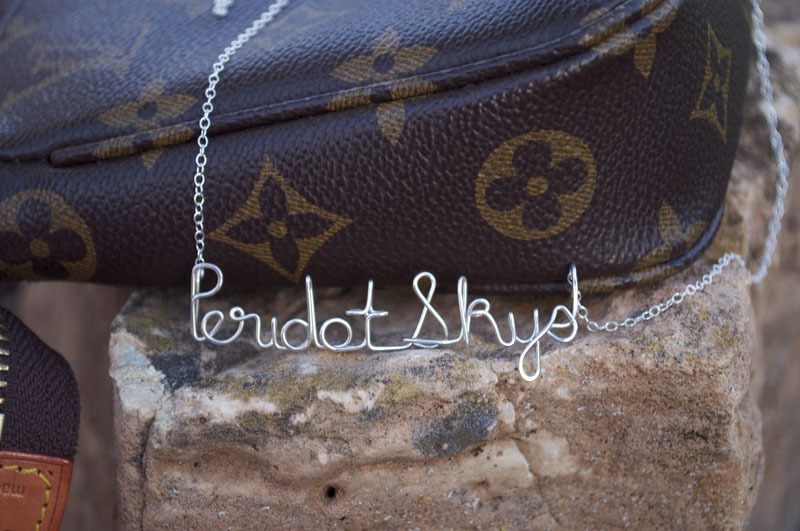 She made for me a sterling name necklace of my blog! I love it! What a great way to share my love of blogging! Isn't it fabulous? 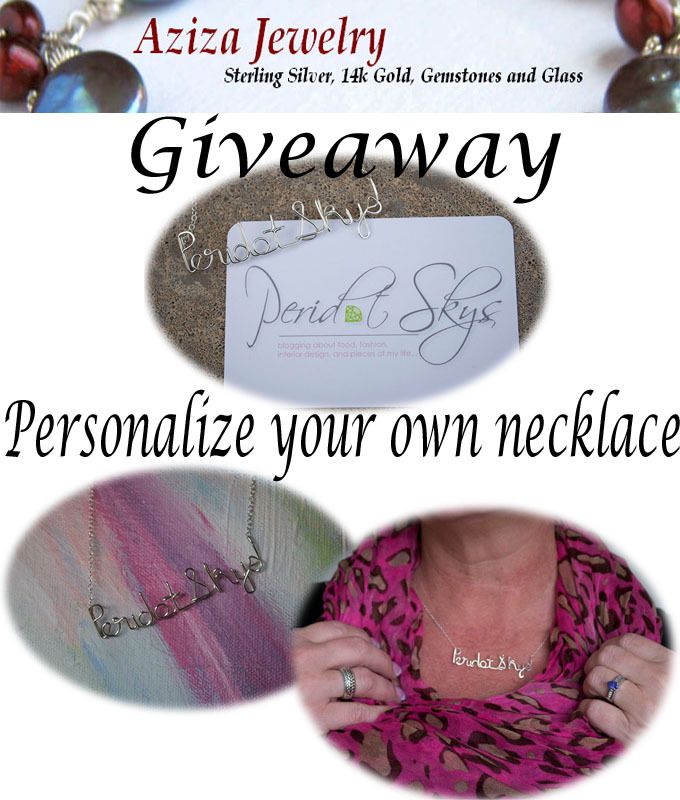 Aziza and I have teamed up to offer one lucky follower their very own personalized sterling wire necklace, in their choice of words! Do you want your blog name? Maybe your child's name? or how about your initials? There are so many choices to select from. You may even just simply have the word LOVE! Aziza has been an entrepreneur from an early age. Read what she has to share about her love for what she does and her passion for jewelry in her own words. "I Love making jewelry. There's something about it that soothes my heart and calms my soul and when I am in the moment, I know I am fulfilling my purpose. Hours can go by and I am so involved in what I'm doing, designing and making jewelry, that time seems irrelevant. After studying Fine Art in college and receiving a BFA, I decided to continue my education further and pursue my dream of learning how to work with glass on a flamework torch. I fell in Love immediately! It was scary, fun, and exhilarating. And after taking several classes in lampworking, and fusing glass, and mastering it, I began using it in my own personal jewelry and wearing it. Once friends, family, co-workers and even passerby's on the street wanted what I was wearing, I knew I had to make it available for sale, and so Aziza Jewelry was born. Along the way...I've had so many wonderful opportunities, including working for a very large international luxury jewelry company, and a spiritually inspired NYC based jewelry company and to also be in a position to learn the ins and outs of the business. After deciding to get special training in lampworking and metal-smithing, pmc, and glass fuseworking, I ventured out on my own and began creating and selling my jewelry at craft shows in Brooklyn, NY and when the demand picked up, I started selling online. And here I am! But thats not just who I am. I am also someone who is very interested in empowering other creative people to become fully and powerfully self expressed whether thats by expressing themselves through personal style or accessories or by creating art themselves. Besides being a glass artist and jewelry designer, I also teach jewelry making and glass bead-making here in the 5 Boroughs. I enjoy teaching and creating jewelry equally but above all I'm honored to be able to share my gifts with the world." So you are an impatient person? Don't want to wait to win? I can relate to that! Aziza is offering a 15% discount for any orders placed until November 15th! And, with every $40 or more purchase until November 15th she will add a pair of studs for free! What a deal! Just enter the code ABJ367 at checkout. So get to it and enter, and order up!! Enter below using the rafflecopter form. Don't forget to follow the instructions to make sure your entry counts. I think I would get my initials - KRB...my name is a little long for the necklace! I'd get "love" on my necklace!